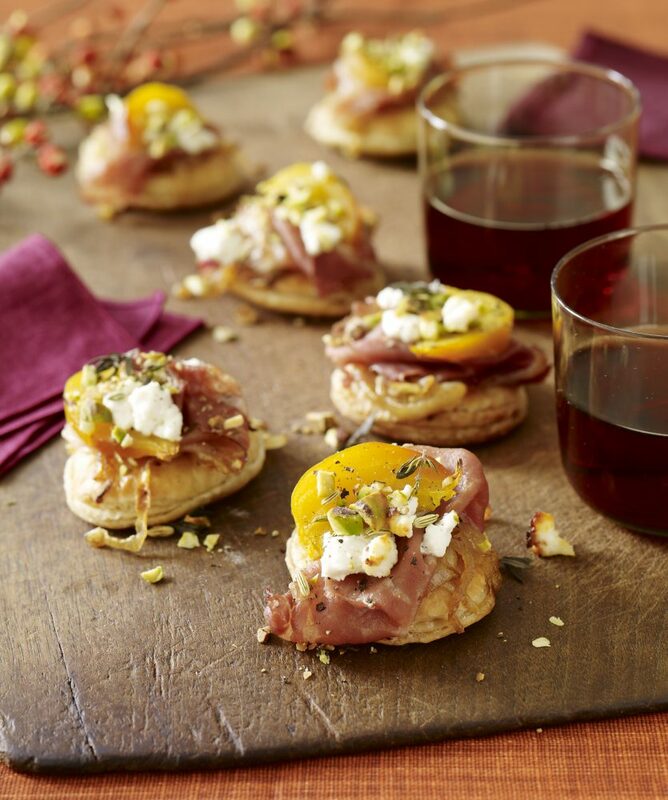 Trust us, these charming little tarts with prosciutto and cheese will please any crowd but you won’t need a special occasion to make them – just a bit of good taste and appetite. Fennel seeds hit your tongue with a zing of licorice, which only compliments the sweet earthiness of golden roasted beets. The warmth and inviting aromas of these prosciutto and cheese tarts will always make your kitchen the most popular room in the house. Wrap beets in foil. Bake about 1 hour or until tender; set aside and let cool. Heat 2 tablespoons of the oil in a large skillet over medium heat. Add onions, stir, cook 2 minutes. Reduce heat to medium-low. Let onions cook 20 to 25 minutes, stirring occasionally, until soft and golden brown. Stir in the salt, 1/8 teaspoon of the pepper and 1/2 teaspoon of the thyme. Set aside. When beets are tender, peel and slice into thin wedges. Place in a bowl with 1 tablespoon of the oil; toss gently to coat. Roll pastry into a 12-inch square on a lightly floured surface. Cut into 16 squares or circles with a cookie cutter. Prick each pastry round a few times with a fork. Brush with egg; sprinkle with seeds. Transfer squares to a parchment lined baking sheet. Bake 10 minutes until lightly puffed. Top with caramelized onions, prosciutto, a beet slice, cheese, pistachio nut and the remaining thyme and pepper. Bake an additional 10-15 minutes until pastry is golden.